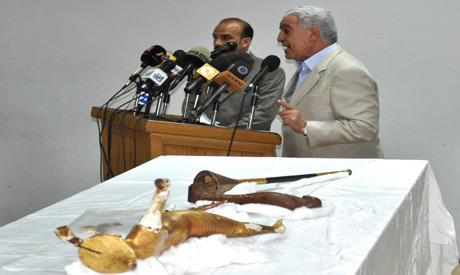 At the premises of the Ministry of State for Antiquities Affairs (MSAA), an international press conference was held in which the Minister of State of the MSAA, Zahi Hawass, announced the return of four statues that had gone missing from the Egyptian museum during Egypt’s January Revolution. Amongst the returned objects was the gilded wooden statue of the boy-king Tutankhamun, standing in a boat throwing a harpoon. The statue had suffered slight damage with a small part of the crown missing in addition to pieces of the legs. The boat remains in the museum, while the figure of the king is undergoing restoration. The second object is one of the 10 missing ushabtis of Yuya and Thuya. “It is still in a very good condition,” Tarek El-Awady, director of the Egyptian Museum, told Ahram Online. He went on to say that the ushabti figurine does not require restoration and will be placed immediately back on display. Another of the returned objects is a gilded bronze and wooden trumpet of Tutankhamun (JE 62008). It was received in excellent condition and will similarly be put on display straight away. The last of the returned pieces was a part of Tutankhamun’s fan. One face is in good condition while the other has been broken into 11 pieces. However, part of the royal fan remains missing. Egyptologist Hala Hassan, curator of the Tutankhamun collection at the Egyptian Museum, told Ahram Online that the trumpet has magical abilities. According to Hassan, whenever someone blows into it a war occurs. A week before the revolution, during a documenting and photographing process, one of the museum’s staff had blown into it and a week after revolution broke out. The same thing had happened before the 1967 war and prior to the 1991 gulf war, when a student was doing a comprehensive research on Tutankhamun’s collection. Salah Abdel Salam, a public relation personal at the MSAA, came upon these objects during his daily trip to work on the Metro. He related that he accidently found an unidentified black bag placed on a chair in the Shubra Metro station. Doubtful that the bag was concealing an explosive, Salah opened it and found the Tutankhamun statue gazing up at him. He took the bag and handed it over to the MSAA. Hawass told reporters that he is calling on all Egyptians to return any objects that they have found. He emphasised that the MSAA will not file any law suit against them but instead will compensate them. “If anyone is afraid of handing over such objects they can put it at the MSAA entrance gate or the Egyptian Museum’s door and we will take care of them,” announced Hawass. He also stated that now, following the return of these objects, the number of missing pieces from the museum has reached 33 objects out of 54. Following restoration, an exhibition of the reinstated objects will be put on display at the Egyptian Museum, in an attempt to celebrate the World Heritage Day on 18 April. Hawass also stated that following his meeting with Field Marshal Hussein Tantawi, head of the Supreme Council of Army Forces, the establishment of a security department for antiquities and archaeological sites has been agreed upon. This department will included a number of armed guards who are well educated and trained by the National Security Forces, in order to be able to safeguard the sites and to deal with any further break-ins. Wow! Magic trumpets. Superstitious are we? It strains credulity to hear that artifacts stolen from the museum just happen to be found by accident in a train station by an employee of the ministry. Is anyone at Ahram.org going to question this extraordinary coincidence?